Hanging with the locals. Photo by Phil Lutz. 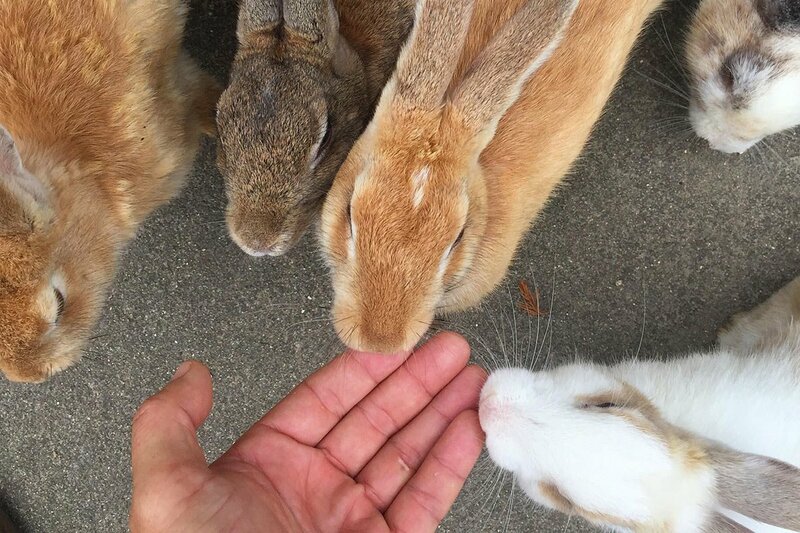 We could hardly believe our eyes when Fathom reader Phil Luza sent over photos of the wild rabbits he encountered on a recent trip to Okunoshima, Japan. 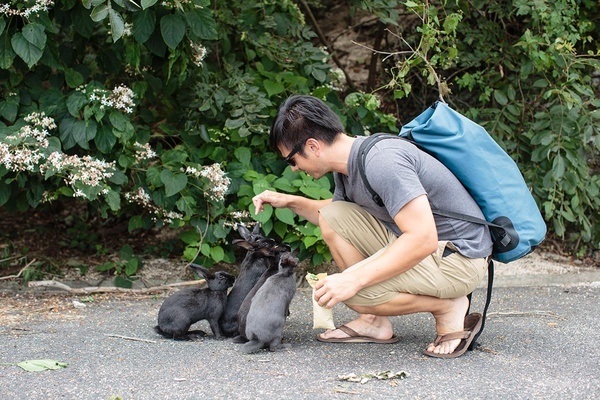 We were just as stunned to learn that in years past, the island was home to a secret stash of chemical weapons but today is full of friendly bunnies roaming free, eagerly awaiting tourists who come from far and wide to feed, play, and take photos with them. 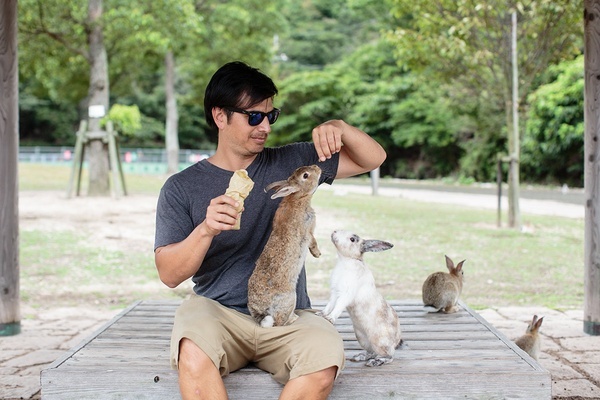 OKUNOSHIMA, Japan – Okunoshima, also known as Rabbit Island, may be the cutest place on Earth. I first learned of it through a YouTube video where a Japanese woman was playfully chased by a flock of tiny bunnies. Such an idyllic place could only exist in Japan, the land of the cute. Living and traveling throughout the country, I couldn't help but notice the overwhelming cuteness. I regularly spot Hello Kitty backpacks, pastries carefully shaped like baby animation characters, and perfectly groomed toy poodles obediently following their equally fashionable owners. In a time of collapsing economies, ethnic clashes, and environmental turmoil, it is comforting to take a step back and see the world this way. It seems simplistic and childish, but I don't think there is anything wrong with that. Video: Feeding frenzy of cuteness courtesy of My BB Bunny. Ironically, the tiny semi-tropical island once produced weapons of mass destruction that caused gruesome deaths and destruction. 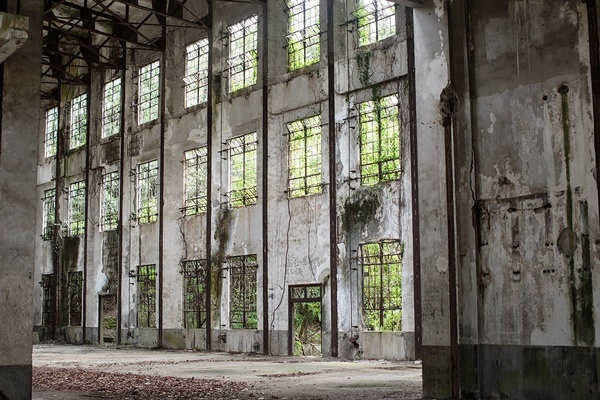 These factories and warehouses are now populated with thousands of tame, friendly rabbits. On a recent trip through southern Japan, I decided to experience Rabbit Island for myself. The thousands of bunnies, blue waters, and sandy beaches make Okunoshima a peaceful and unique getaway. Located within the Inland Sea of Japan and off the coast of Hiroshima, Okunoshima is easily accessed by ferry. Once there, you immediately see why it's called Rabbit Island. Teams of big-eyed cottontails eagerly hop over for treats. With no fear of humans or natural predators, the bunnies are more than happy to jump in your lap, snack from your hand, or crawl on top of you. The trip left me smiling and my clothes smelling like bunnies. It was a one-of-a-kind fairytale experience. The author making friends. Photo by Anna Gomes. In 1925, the Imperial Japanese Army initiated a secret program to develop chemical weapons, choosing the island because of its isolation. Although Japan signed the 1925 Geneva Protocol banning the use of chemical warfare, the development and storage of chemical weapons was allowed by the treaty. The Imperial Japanese Army went to great lengths to assure the secrecy of the facilities, even going so far as to remove records of the island from some maps. After the end of World War II, documents concerning the plant were burned, and people were told to remain silent about the project. The Allied Occupation Forces disposed of the gas either by burning it, dumping it off the coast, or burying it around the island, where containers remain today. Okunoshima was abandoned for decades and, as former military facilities fell into ruin, the rabbit population exploded. With no predators, the bunnies grew up without fear of humans, and the island's popularity became a tourist destination. WHERE DID THE BUNNIES COME FROM? There's no confirmed answer about why the rabbits are here, but there are several theories. One is that the current population descended from test subjects from the chemical weapon facilities who escaped after the war and then, well, did what rabbits famously do and populated the island. Although charming, this rumor seems unlikely, as records indicate that the rabbits were destroyed in 1945. 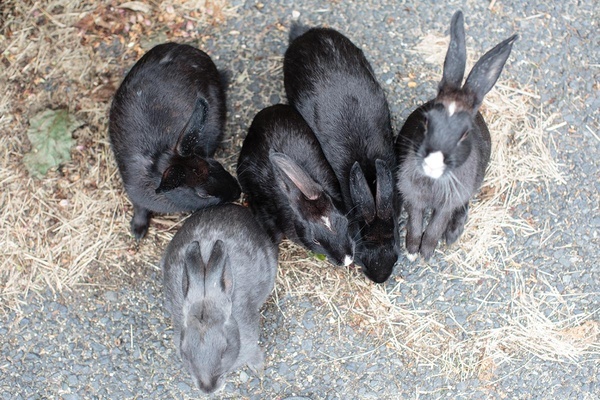 Another theory is that a schoolteacher brought six rabbits in for her children to play with and that the thousands of rabbits that inhabit the island today are their descendants. A third theory says the rabbits were intentionally set loose after World War II as a way to develop the island as a tourist destination. Whatever the real cause, the rabbits continue to multiply and have become an international draw for animal lovers. 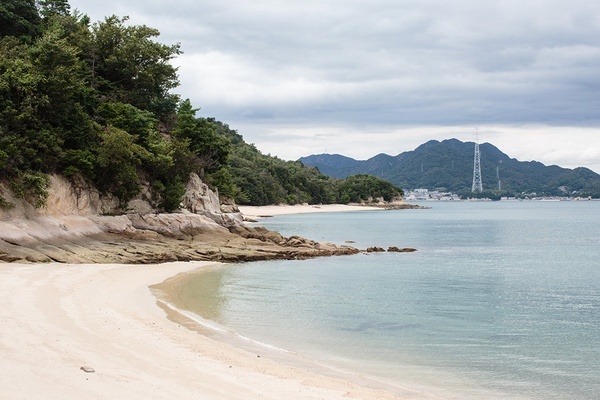 In a stark contrast to the munitions and poison gas that were formerly manufactured here, Okunoshima is tranquil and idyllic, with easy hiking trails, white sand beaches, historical buildings, a hotel, and, of course, lots of cute bunnies. There are several nice beaches that are great for swimming during warmer months. A Japanese-style hot spring available for daily use at the island's only hotel. It's great for washing off dirt and bunny urine. Japanese-style rooms located in the heart of the island. Facilities include a Japanese onsen, tennis courts, a pool, and a karaoke room. Reservations often include breakfast and dinner. There are full-service campsites located close to the beach and near the visitor center, so you can be surrounded by your new bunny friends. 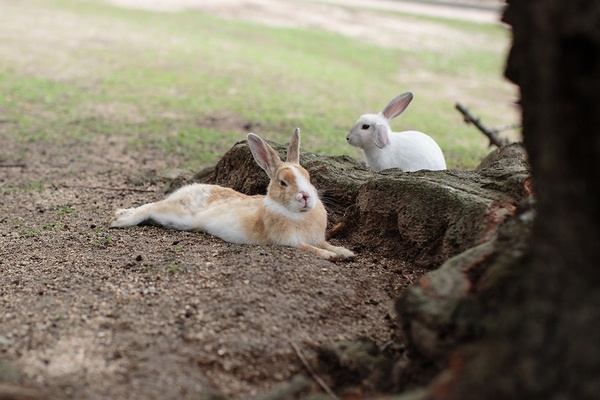 Rabbit Island is a great day trip from Hiroshima. It takes approximately two hours from Hiroshima to Tadanoumi (and is a good use of that Japan Rail Pass). The train leaves at 9 a.m. in the morning and returns to Hiroshima at 6 p.m. The twelve-minute ferry to Rabbit Island leaves from Tadanoumi Port, a short, ten-minute walk from Tadanoumi Station. When exiting the station, take a right and follow the signs. There is a convenience store to the left. It's a good idea to buy drinks and snacks, as options are limited on island. When you arrive at the port, tickets can be purchased from the vending machine or ticket counter. The round-trip ferry costs ¥620; bunny food costs ¥100. The island's hotel also sells rabbit pellets. The free bus to the public hotel will be waiting at the pier when you arrive. If you'd like to walk, it takes about fifteen minutes. Phil is an adventure enthusiast with panache who always wants to have a good time. You can follow him on Instagram and Medium.